It’s midsummer and beach season is in full swing with a myriad of swimsuit styles. Much has changed since the early 1900s, and, thank goodness, as it seems that a lot of swimwear from a century ago was considered dangerous, even in its own time. Any bloomer is more or less a danger to its wearer in salt water; the balloon bloomer is decidedly so and a word of warning concerning this new type of bathing suit is in season…Wear the bloomers into the sea and come out after your bath and dress immediately and there will be no danger at all. But on no account enter the water from a height (like the end of a pier or a boat) after the bloomers have become wet from one immersion. The swift passage through the air may force air into the bloomers, at waistband or knee and the bloomers will immediately fill out exactly like a pair of water wings — and will retain the air which cannot force its way out again under water. As the bloomers are worn low on the body, they will keep the legs and feet afloat, the heavier part – – torso and head – – going under…. Yikes. 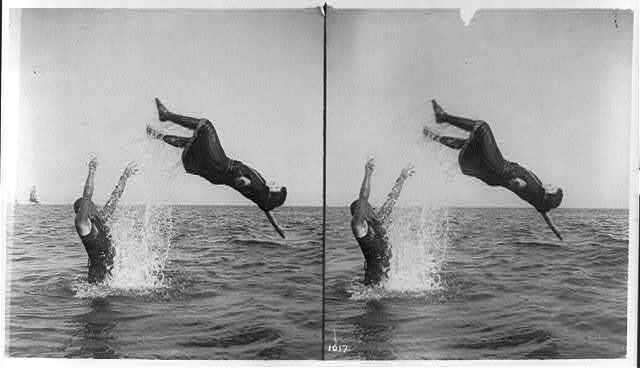 I have quite the picture in my head right now, imagining the fate of the young woman being tossed in the photograph below from the Library of Congress’ online collection. 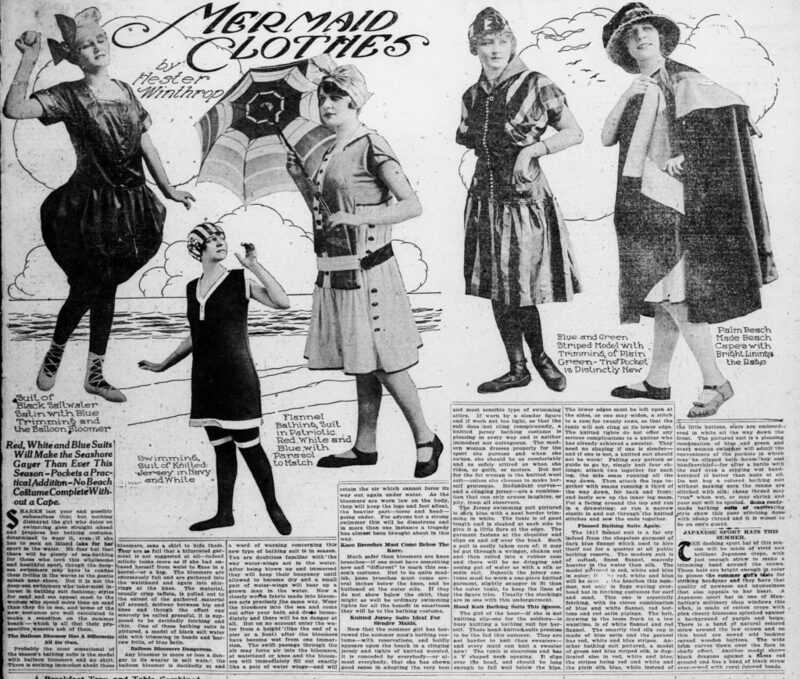 In Splash: A History of Swimwear (New York, 1990), the author writes that “as late as the 1920s some local ordinances in America called for women to be fined and removed from the beach for indecent exposure, including legs without stockings, despite beach shoes and long skirts” (pp. 58, 60). The Library of Congress has some great images online of bathing fashion, including a great panoramic photograph from June 20, 1920 called Annual “Bathing Girl Parade.” The whole panoply of styles of swimwear and accessories are on display. For men’s swimwear in the early 1900s “a top covered the shoulders, but permitted movement of the arms, and body-hugging leggings could be rolled up from the knee. What was essential, however, was that this functional outfit not be confused with the patent indecorum of swimming in one’s underwear. Indeed, the self-conscious suit elements of men’s swimwear, including superfluous belts and buckles and bright striping unlike any found in underwear, were introduced explicitly in order to differentiate swimwear from underwear (Splash: A History of Swimwear, New York, 1990, p. 54). We’ve come quite far in 100 years with the fashion and can’t quite imagine what the next 100 will bring. For now, enjoy the beach in whatever fashion suits you. Martin, Richard, and Harold Koda. Splash! : A History of Swimwear. New York: Rizzoli, 1990. Clemente, Deirdre. 2007. “Made in Miami: The Development of the Sportswear Industry in South Florida, 1900-1960,” Journal of Social History 41, no. 1 (Fall 2007): 127-148.